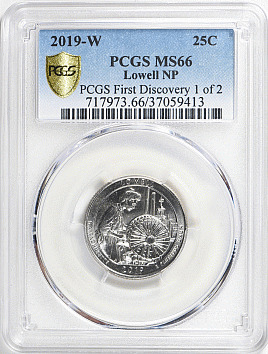 Discovered by Michael T. in Virginia and tied with one other coin to be awarded the First Discovery designation (this auction is for the finer of the two coins; the other graded PCGS MS-65). The two submitters split a $5000 reward paid by PCGS. Description: Discovered by Michael T. in Virginia and tied with one other coin to be awarded the First Discovery designation (this auction is for the finer of the two coins; the other graded PCGS MS-65). The two submitters split a $5000 reward paid by PCGS.